Thermomonospora curvata Henssen 1957 is the type species of the genus Thermomonospora. This genus is of interest because members of this clade are sources of new antibiotics, enzymes, and products with pharmacological activity. In addition, members of this genus participate in the active degradation of cellulose. This is the first complete genome sequence of a member of the family Thermomonosporaceae. Here we describe the features of this organism, together with the complete genome sequence and annotation. The 5,639,016 bp long genome with its 4,985 protein-coding and 76 RNA genes is a part of the Genomic Encyclopedia of Bacteria and Archaea project. Strain B9T (= DSM 43183 = ATCC 19995 = JCM 3096) is the type strain of Thermomonospora curvata, which in turn is the type species of the genus Thermomonospora . T. curvata was effectively published in 1957 . When the original strains R30 and R71 were no longer cultivable, strain B9 was proposed as the neotype in 1967 . Currently, there are two species in the genus Thermomonospora, which in turn is one of the six genera in the family Thermomonosporaceae . The generic name Thermomonospora was proposed by Henssen  for thermophilic actinomycetes isolated from composted stable manure . Strain B9T was isolated from municipal refuse compost samples . Other (rubber degrading) strains of T. curvata have been isolated from food residues used in animal husbandry in Egypt (strain E4), from compost in Germany (strain E5) , and also from municipal solid waste compost (probably USA) [6–9]. Cellulase biosynthesis has been studied in a catabolite repression-resistant mutant of T. curvata . Here we present a summary classification and a set of features for T. curvata strain B9T, together with the description of the complete genomic sequencing and annotation. The 16S rRNA gene sequence of the strain B9T (AF002262) shows 98.1% identity with the 16S rRNA gene sequence of T. curvata strain E5 (AY525766) .The distance of strain B9T to other members of this family ranged between 5% and 7%. Further analysis shows 94% 16S rRNA gene sequence identity with an uncultured bacterium, clone BG079 (HM362496) and 92% similarity to compost metagenome contig00434 (ADGO01000428)  from metagenomic libraries (env_nt) (status October 2010). A representative genomic 16S rRNA sequence of T. curvata was compared using NCBI BLAST under default settings (e.g., considering only the high-scoring segment pairs (HSPs) from the best 250 hits) with the most recent release of the Greengenes database  and the relative frequencies, weighted by BLAST scores, of taxa and keywords (reduced to their stem ) were determined. The five most frequent genera were Actinomadura (54.3%), Nocardiopsis (12.5%), Actinocorallia (8.8%), Jiangella (5.8%) and Actinoallomurus (5.0%) (208 hits in total). Regarding the two hits to sequences from members of the species, the average identity within HSPs was 99.9%, whereas the average coverage by HSPs was 96.2%. Regarding the single hit to sequences from other members of the genus, the average identity within HSPs was 95.2%, whereas the average coverage by HSPs was 58.4%. Among all other species, the one yielding the highest score was Actinomadura cremea, which corresponded to an identity of 96.3% and a HSP coverage of 85.3%. The highest-scoring environmental sequence was HM362496 (‘microbial naturally composting sugarcane piles decomposting bagasse clone BG079’), which showed an identity of 94.5% and a HSP coverage of 96.3%. Within the labels of environmental samples which yielded hits, the five most frequent keywords were ‘soil’ (4.7%), ‘compost’ (3.1%), ‘microbi’ (2.4%), ‘skin’ (2.0%) and ‘acid’ (2.0%) (41 hits in total). These keywords partially fit to the ecology of compost and food residues, from which the known strains have been isolated [1,5,6]. Environmental samples which yielded hits of a higher score than the highest scoring species were not found. Figure 1 shows the phylogenetic neighborhood of T. curvata B9T in a 16S rRNA based tree. The sequences of the four 16S rRNA gene copies in the genome differ from each other by up to one nucleotide, and differ by up to five nucleotides from the previously published 16S rRNA sequence (D86945), which contains one ambiguous base call. Strain B9T is facultatively aerobic, Gram-positive, non-acid-alcohol-fast, and chemoorganotrophic [1,4 Table 1]. Based on the original literature, the morphology of neotype B9T was the same as of the original strains [1–2]. 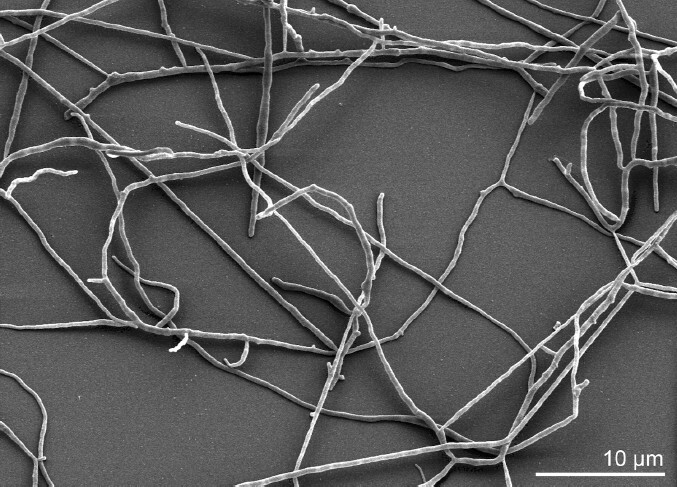 Substrate mycelium was branched and bared aerial hyphae that differentiated into single or short chains of arthrospores [2–4] (Figure 2, arthrospores not visible). Spores were formed by the differentiation of the sporophores when they reached a given width . Polymorphic and single spores in clusters appeared with a folded surface on branched and unbranched sporophores . They had spindle, lemon or pear forms varying between 0.6–1.5 x 0.3–0.9 µm . The optimal growth occurred at 50°C. However, weak growth was observed at 40°C and 65°C, but no growth at 28°C . Colonies were white or yellow depending on culture medium . On meat extract agar, the growth was moderate, aerial white mycelium formed and the colonies were yellow to brown . On asparagine glucose agar, the growth was low and the aerial mycelium white . On casein glucose agar, a few single colonies were observed . The growth was good and the aerial mycelium white on cellulose agar medium . On Czapek agar, a few spotty colonies were observed . On Czapek peptone agar, the growth was good, almost no aerial mycelium formation . When oatmeal agar was used as medium, the growth was good and the aerial mycelium white . The growth on yeast agar was good, with thick aerial mycelium. In this case, colonies were partially yellow . On yeast glucose agar, the growth was good, aerial mycelium developed later and was white while brownish colonies were formed . On yeast starch agar, the growth was good, white aerial mycelium was formed and colonies were yellow to orange . On potato agar I, spotty growth is observed, while no aerial mycelium was formed . Few single colonies formed on potato agar II . On starch agar medium, the growth was moderate and aerial mycelium was white . Strain B9T showed endogluconase activity and attacks cellulose . It was also active in the decomposition of municipal waste compost [6–9]. When grown on protein-extracted lucerne fiber compound, strain B9T released 16 times more β-glucosidases compared to growth on cellulose or purified cellulose . Strain B9T grew well at pH 7.5 on any nutrient medium that contains some yeast extract. It showed significant growth even at pH 11 . Tests of the nitrate reduction and phosphatase were positive . The sole carbon sources (1%, w/v) were ribose and sucrose. L-arabinose, galactose, lactose and mannitol were not used . Strain B9T was able to degrade agar, cellulose powder (MN300), carboxymethylcellulose, keratin, xylan, starch, Tween 20 and Tween 80 . Growth was also observed in the presence of crystal violet (0.2 µg/ml), but it was inhibited by kanamycin and novobiocin (each 25µg/ml) . The inability to utilize pectin is an important feature that differentiates strain B9T from other members of the genus Thermomonospora. Amylases of the strain B9T were extremely active and stable at 60–70°C and slightly acid to neutral pH [36–38]. Also, endoglucanase and exoglucanase were active in the strain . Cellobiose was found to be a good cellulase inducer . Strain B9T possesses a cell wall type III with A1γ and with meso-diaminopimelic acid as major constituent [4,41,42]. The principal menaquinones are MK-9(H4), MK-9(H6) and MK-9(H8), with MK-9(H6) being the predominant one (the profile type sensu Kroppenstedt is termed 4B2 ) . The fatty acid profile was described to be of type 3a . Members of this type can synthesize terminally branched and 10-methyl-branched fatty acids . T. curvata lacks madurose, a type C sugar and has polar lipids of type IV , represented by phosphatidylinositol (PI) and unknown phospholipids (PL), which according to Lechevalier [44–45] are, phosphatidyglycerol (PE), phosphatidylinositolmannosides(PIM) and diphosphatidylglycerol (DPG) . T. curvata B9T, DSM 43183, was grown in DSMZ medium 550 (CYC medium, modified following Cross and Attwell, 1973)  at 45°C. DNA was isolated from 0.5–1 g of cell paste using MasterPure Gram-positive NDA purification kit (Epicentre MGP04100) following the standard protocol as recommended by the manufacturer, with modification st/LALM for cell lysis as described in Wu et al. . DNA is available through the DNA bank Network [49–50]. 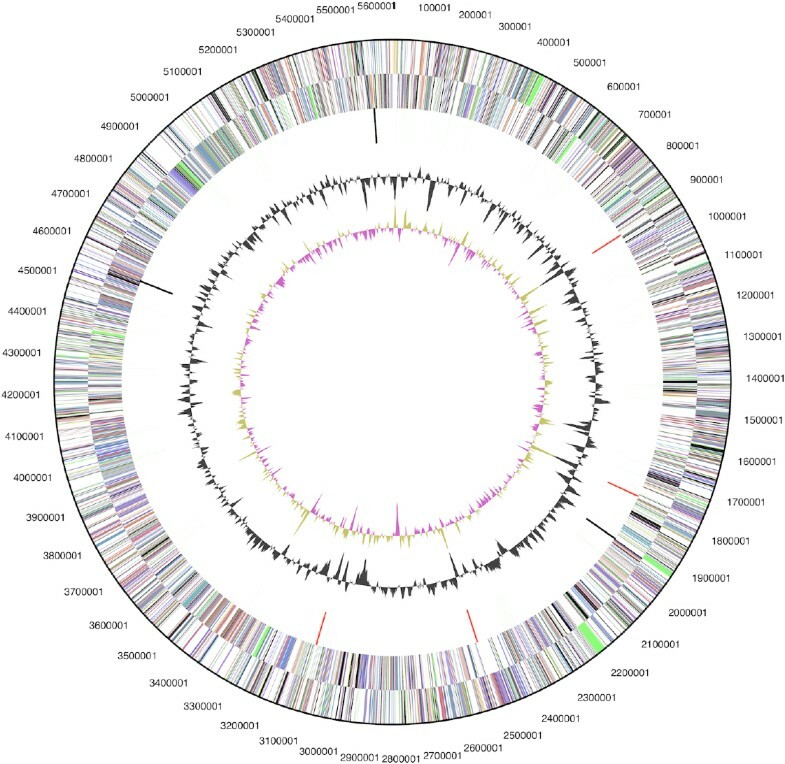 The genome of was sequenced using a combination of Sanger and 454 sequencing platforms. All general aspects of library construction and sequencing can be found at the JGI website . Pyrosequencing reads were assembled using the Newbler assembler version 1.1.02.15 (Roche). Large Newbler contigs were broken into 6,203 overlapping fragments of 1,000 bp and entered into assembly as pseudo-reads. The sequences were assigned quality scores based on Newbler consensus q-scores with modifications to account for overlap redundancy and adjust inflated q-scores. A hybrid 454/Sanger assembly was made using the parallel phrap (High Performance Software, LLC). Possible mis-assemblies were corrected with Dupfinisher  or transposon bombing of bridging clones (Epicentre Biotechnologies, Madison, WI). A total of 2,673 Sanger finishing reads were produced to close gaps, to resolve repetitive regions, and to raise the quality of the finished sequence. Illumina reads that were used to correct potential base errors and increase consensus quality using a software Polisher developed at JGI . The error rate of the completed genome sequence is less than 1 in 100,000. Together, the combination of the Sanger and 454 sequencing platforms provided 36.3 × coverage of the genome. The final assembly contains 73,067 Sanger reads and 602,893 pyrosequencing reads. The genome consists of a 5,639,016 bp long chromosome with a 71.6% GC content (Table 3 and Figure 3). Of the 5,061 genes predicted, 4,985 were protein-coding genes, and 76 RNAs; ninety five pseudogenes were also identified. The majority of the protein-coding genes (64.7%) were assigned with a putative function while the remaining ones were annotated as hypothetical proteins. The distribution of genes into COGs functional categories is presented in Table 4. We would like to gratefully acknowledge the help of Marlen Jando for growing T. curvata cultures and Susanne Schneider for DNA extraction and quality analysis (both at DSMZ). This work was performed under the auspices of the US Department of Energy Office of Science, Biological and Environmental Research Program, and by the University of California, Lawrence Berkeley National Laboratory under contract No. DE-AC02-05CH11231, Lawrence Livermore National Laboratory under Contract No. DE-AC52-07NA27344, and Los Alamos National Laboratory under contract No. DE-AC02-06NA25396, UT-Battelle and Oak Ridge National Laboratory under contract DE-AC05-00OR22725, as well as German Research Foundation (DFG) INST 599/1-1.